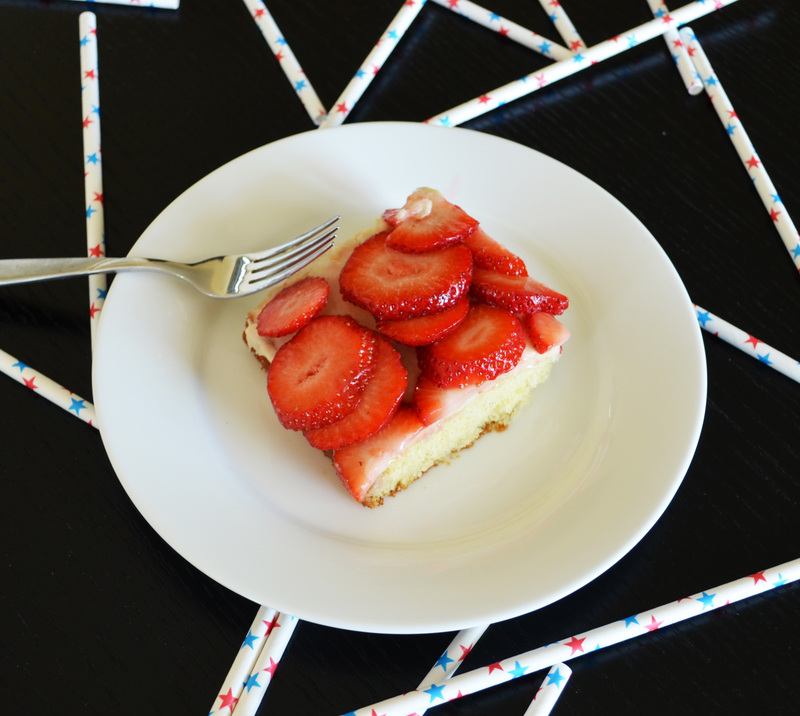 Update… This American flag design is the perfect way to dress up one of mine and my toddlers favorite desserts, The Best Strawberries and Cream Cake! I hope this simple and delicious dessert becomes one of your Fourth of July traditions to make year after year! Fire works are such a magical time every fourth of July. As I sit here typing this all I can think of is the excitement I had as a child watching the colorful show. It’s funny because that same excitement is still there as an adult. Just waiting for the grand finale that is so amazingly beautiful. Now being a mom of a toddler who can’t stay up late enough to watch no matter how hard I try, all I can do is pray they don’t startle and wake him. I can not wait till a year or two when I can see the excitement and joy on my child’s face for the incredible light show. So while I sit at home this fourth of July evening, the kid in me is impatiently waiting for that special time when I can share this wonderful holiday tradition with my little one! Simply pour the cake mixture into a longer pan so you get a thin layer of sweet cake, topped with luscious and creamy cream cheese frosting. The perfect grand finale to this cream cake is the thinly sliced strawberries all on top, with a sprinkle of sugar all over to add extra sweetness. This cake is simple and beautiful. I can not compare this dessert to my Raspberry Cream Filled Cupcakes even though they have many similarities. This recipe takes a little less time than the cupcakes and is oh so delicious. Special note: Flag Cake, If you would like the white cream in between the berries brighter you can pipe (use a pastry bag with the star attachment) fresh whipping cream or buy canned whip cream. Add the whip cream just before serving. Do you have a recipe with baking mix made from scratch, here in the UK unfortunately we don’t have Trader Joe. I did try with my own mix but it didn’t come out as it should. I’m keen to use up the last of our fantastic glut of strawberries, the best we’ve had in years. Hi Jenny, I do not have one at the moment that would work as lovely as the Trader Joe Cake mix does. I would have to experiment around with that a bit to figure it out. Any Cake recipe with vanilla will do I would just follow the instruction on that recipe for cooking the cake. If I come up with any other options other than getting a Trader Joe’s by you :)I will inform you right away.